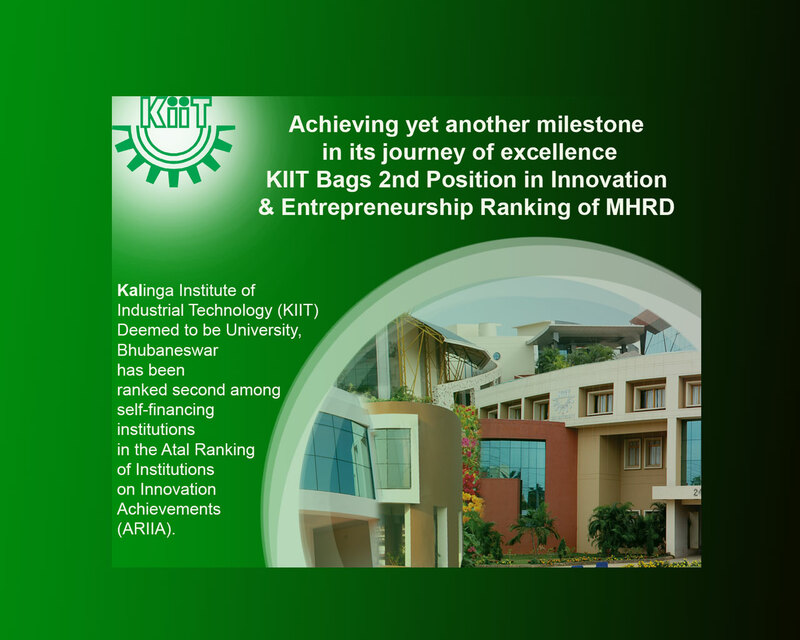 Achieving yet another milestone in its journey of excellence, Kalinga Institute of Industrial Technology (KIIT) Deemed to be University, Bhubaneswar has been ranked second among self-financing institutions in the Atal Ranking of Institutions on Innovation Achievements (ARIIA). The President of India, Shri Ram Nath Kovind gave away the award to KIIT in a special function held in New Delhi. Dr. Mrutyunjay Suar, Director, KIIT School of Biotechnology received the award from The President of India. ARIIA is an initiative of Ministry of Human Resource Development (MHRD), Govt. of India to systematically rank all major higher educational institutions and universities in India on indicators related to “Innovation and Entrepreneurship Development” amongst students and faculties. KIIT achieved a high rank due to its innovation and entrepreneurship centers, advanced laboratories, centers of excellence, collaborations with industries and international institutions. This ranking will provide a boost for the institute that is constantly striving for academic and research excellence as well as excellence in innovation and entrepreneurship among students and faculty. The first rank among self- financing institutions was bagged by VIT, Vellore, while SRM stood third. Similarly, KIIT Deemed to be University ranked with 31st position in the list of top 100 Universities of India both in private and government. Meanwhile, The National Institutional Ranking Framework-(NIRF), MHRD 2019 has released the list of top 100 universities in India.